The abstract landscape paintings of Richard Diebenkorn, specifically the Bay Area influenced work made a significant impression on my young artistic eye when I first saw the retrospective of his work at SFMoMA in 1998, as I began planting roots here in SF fresh out of art school. Recently his influence resurfaced to my bench as I began to further work in abstraction with my art jewelry made from LEGO®, translating his paintings into small scale, wearable “sculptural paintings” that convert from pendant to pin to object. The composition of patterns and color ways from his Berkeley series especially caught my eye as lending well to LEGO® reinterpretation. After selecting a painting to work with, I sit with it for quite awhile, viewing from all orientations, honing in on a particular segment to translate into a piece of jewelry. In Diebenkorn's “Berkeley 47” I was drawn to the top left section of the painting and liked it best turned upside down, using the green as earthy grounding. 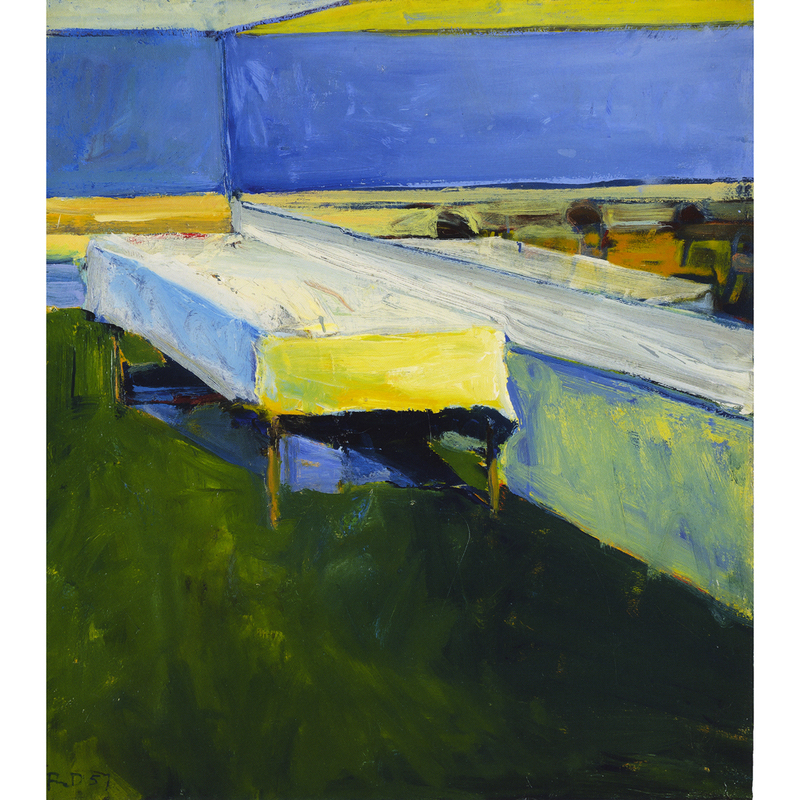 In Diebenkorn’s “The Table” I was drawn to the top left section of the painting and liked it best rotated 90 degrees counter-clockwise, using the yellow table in the painting as a vertical element, deconstructing it into a more 3 dimensional object. In Diebenkorn’s “Untitled Landscape” I was drawn to the bottom half of the painting and rotated it 90 degrees clockwise, using the yellow field as a bottom anchor, utilizing the bold diagonals as a way to break across the usual LEGO® grid.